This post was originally posted in November 2012. I’ve updated the photos and the content just a bit. 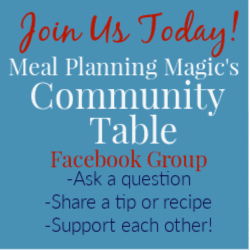 It was originally part of a Sunday Supper event for Food Gifts so I’ve left those links here so you can check them out too. 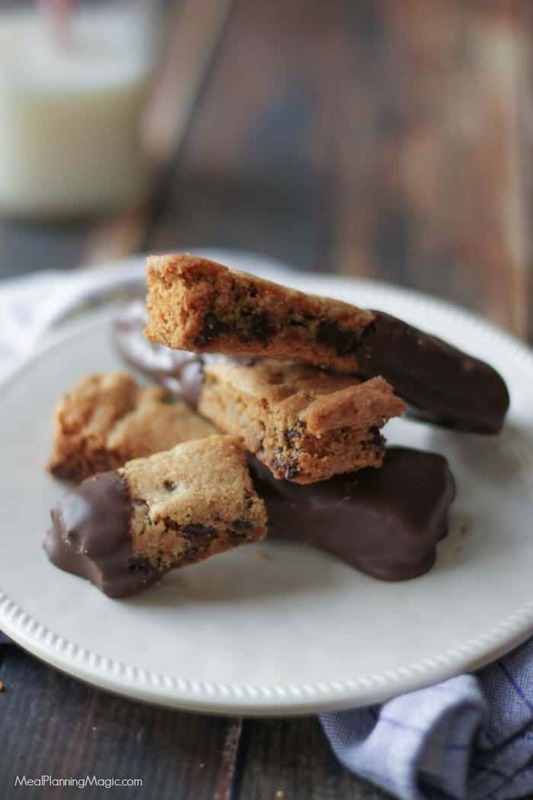 But I promise, this Chocolate Chip Cookie Biscotti is still super yummy! For as long as I can remember, I’ve been making gifts from the kitchen to give to family, friends, neighbors, teachers and others at holiday time. It’s my way of giving a little part of what I love—cooking and baking—to those I care about. 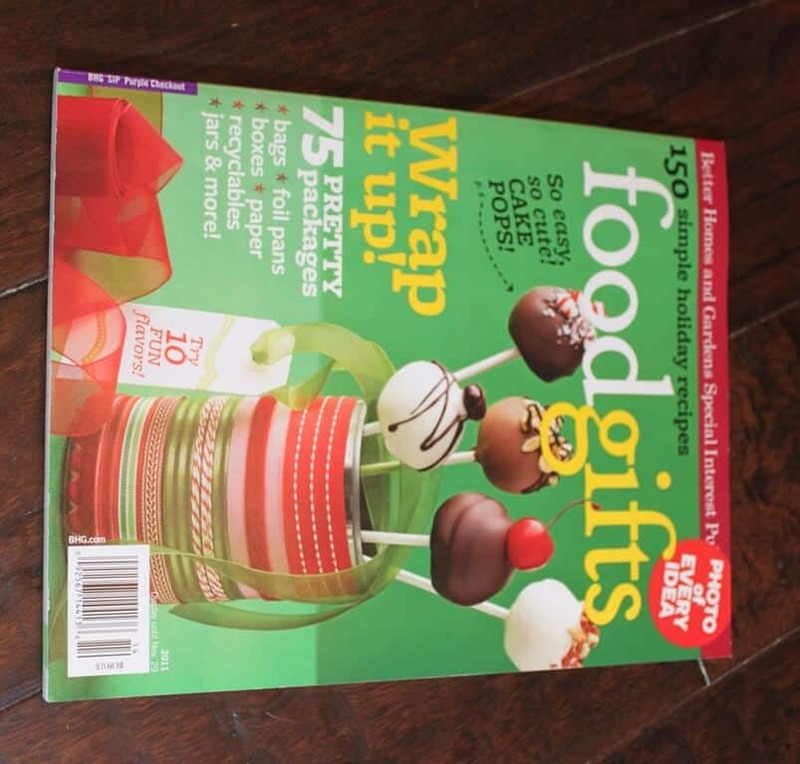 So when I was looking for inspiration, I remembered the Better Homes and Gardens Food Gifts special soft cover book I had bought at the grocery store checkout line. I realized I hadn’t really made much from the book but when I saw the Chocolate Chip Cookie Dunkers I was sold! I mean, who doesn’t love chocolate chip cookies and the idea of being able to dip them into coffee, tea or hot chocolate? Yum! 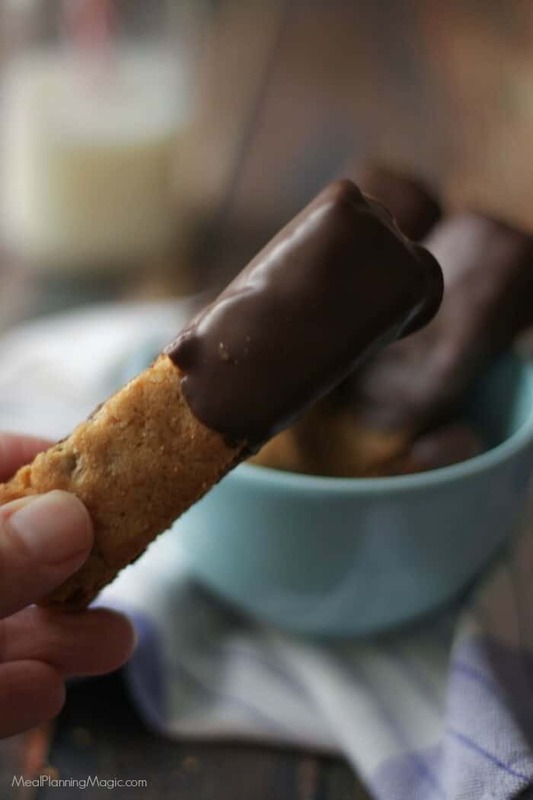 Now I would personally call these biscotti (which is what I’ve done in my title) because the baking process is just like that—you bake it twice. I tweaked the recipe a bit to use all butter but these are still so tasty! While these were pretty easy to assemble, plan to bake these on a day when you have a couple of hours because they need to cool for an hour between each baking. I like to do it in the afternoon or evening when I’m doing other things around the house. These are super cute wrapped up in a clear bag (I buy mine at the craft store like Hobby Lobby or Michael’s in the cake & candy supplies aisle—with a coupon of course!) I added mine to these simple clear mugs that I got at a tag sale and added a gift card. How’s that for a jazzed up food gift? So easy. Let me tell you, these are so yummy that I really had a hard time not snitching them myself! 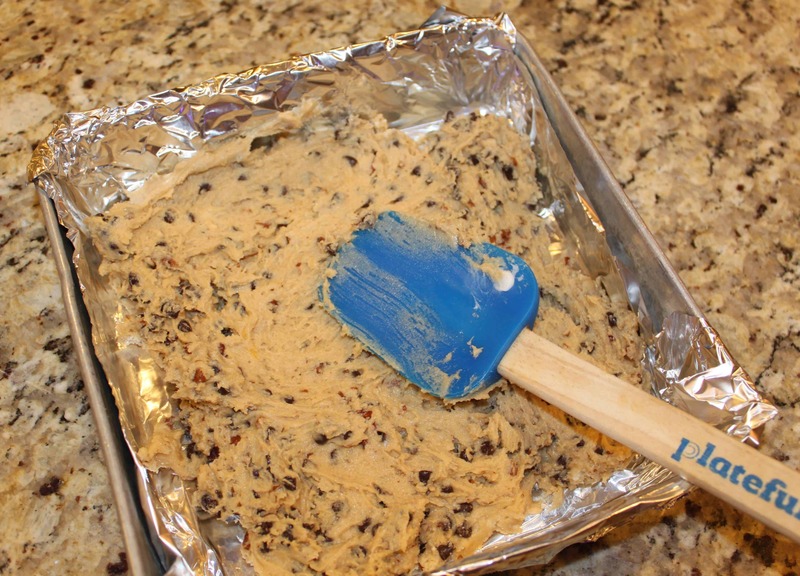 That’s the only downside to this recipe…it only makes 18 so if you’re making gifts for a lot of people, you may want to get your hands on some extra 9×9 pans so you can make multiple batches at one time! Preheat oven to 350F. 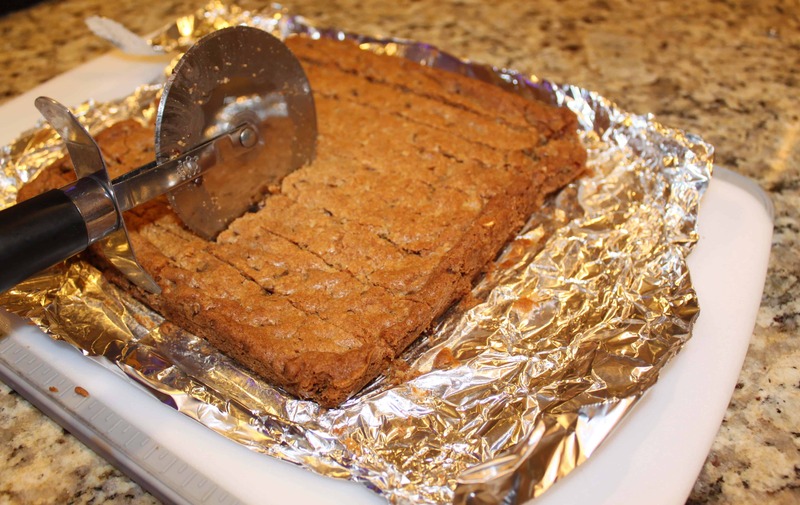 Line a 9x9x2-inch baking pan with foil. You’ll want the foil to hang over the sides a bit. Set aside pan. 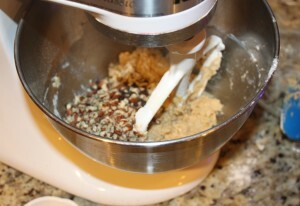 In a medium bowl, combine butter and 1/4 cup shortening with a mixer on medium speed for 30 seconds. Next, add brown sugar, granulated sugar, and baking soda. Beat until combined. Scrape sides of bowl occasionally. Beat in egg and vanilla until combined. Beat in flour. Stir in miniature semisweet chocolate pieces and nuts if you’re using. Spread dough evenly onto bottom of prepared baking pan. Bake for 25 to 30 minutes or until crust is evenly golden brown and center is set. Place on wire rack and cool in pan for 1 hour. Reduce oven temperature to 325F. Using foil, lift baked mixture out of pan and transfer cookie to a cutting board; remove foil. Cut baked mixture into 9x1/2-inch slices then in half down middle (perpendicular to first direction). I like to use my pizza cutter for this. With cut sides down, place slices 1-inch apart on an ungreased cookie sheet. Bake in 325 degrees F oven about 20 minutes or until crisp, turning carefully halfway through baking time. Cool completely on the cookie sheet on a wire rack. 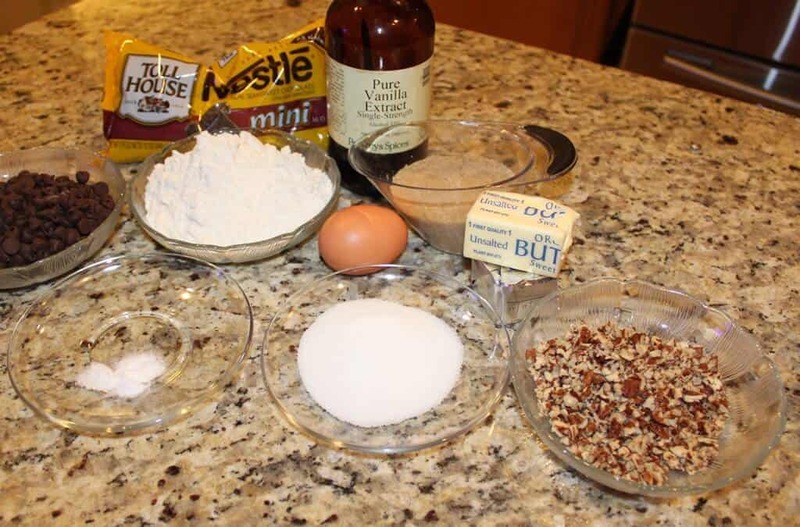 Melt chocolate and shortening over a double boiler until melted and smooth. 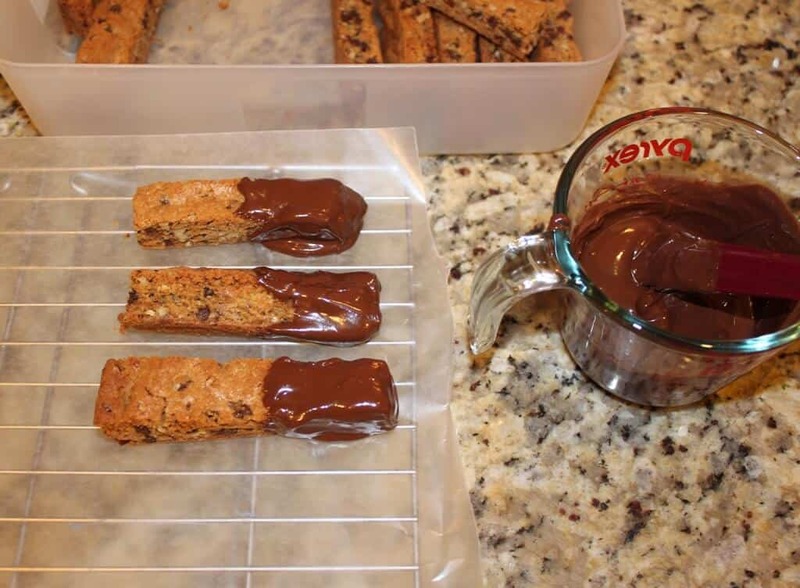 Brush or spread one end of each cookie stick with melted chocolate mixture; let excess drip down sides of cookie. Place cookies on parchment paper or waxed paper; let stand about 1 hour or until set. 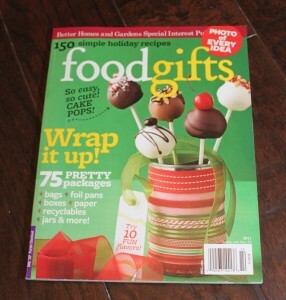 My inspiration: this special Food Gifts issue from last year! Just a few ingredients ready to go! Everything mixes up really quickly! 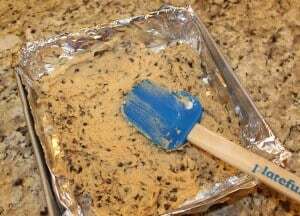 Spread the mixture in the pan using a spatula. The batter is thick! I like to use my big pizza cutter to cut it into rectangles. 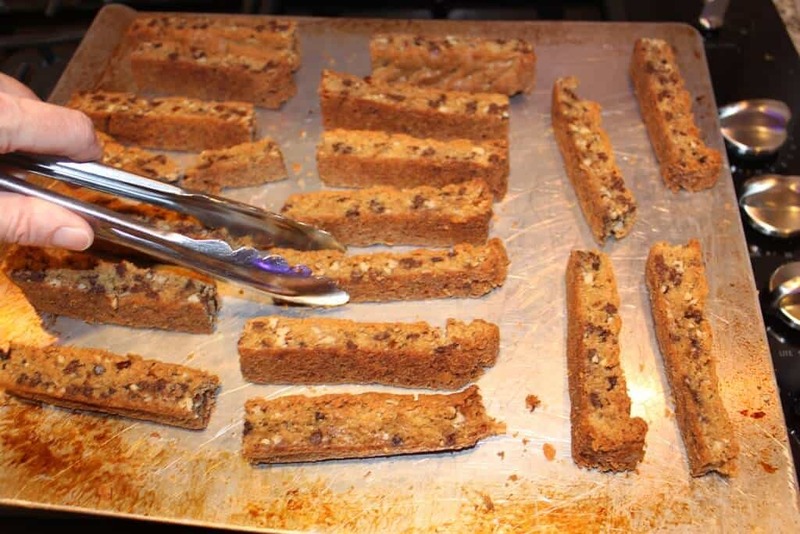 Using tongs to flip the biscotti during it’s second bake makes it a lot easier! 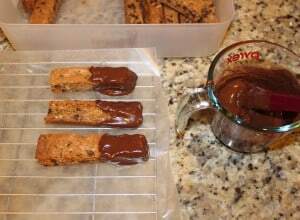 Dipping the biscotti in the chocolate–easy! Here’s the original picture so you can see the difference! « Loaded Baked Potato Dip – Only 5 Ingredients! Sounds so good I’ll pour us some coffee! 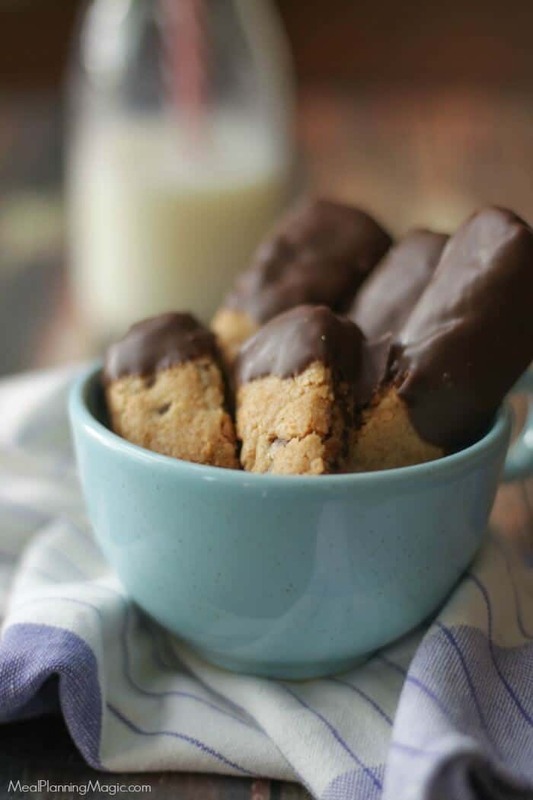 Your biscotti is fabulous. I love the chocolate chips. This would make me happy to receive as a gift. Perfection! My husband LOVES dipping stuff into coffee…this would be perfect for me to make! I could probably drink a whole pot of coffe if I could dunk these little beauties in them. The chocolate takes it over the top. I would love a big bag of these this holiday season. Thanks in advance. These look super delicious! A great gift for the holiday season! Yum! 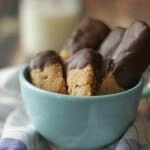 Lovely Biscotti that perfect for tea time….I am going to try this out! Thanks for sharing. 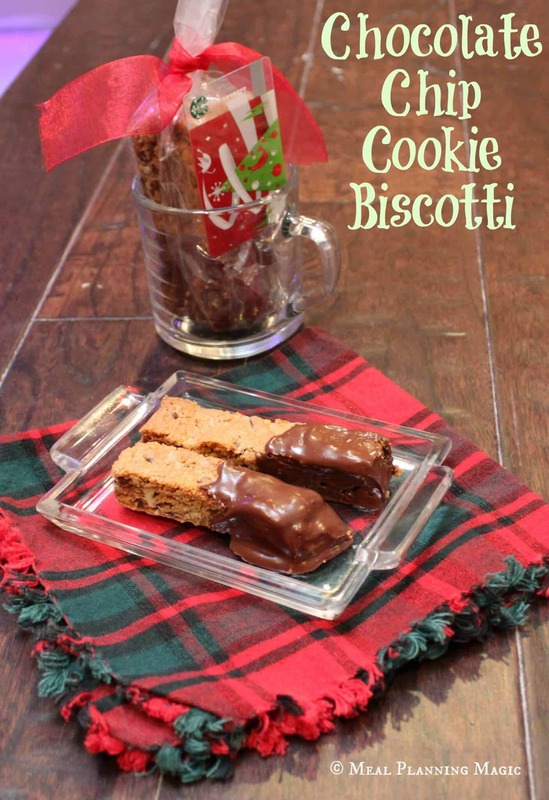 Yum – I love biscotti. Looks, and sounds like a fantastic gift everyone will love! I have never made biscotti but have always wanted to try. And we have the same magazine! It was fabulous last year for ideas. Biscotti has been on my to make list forever. These look delicious! These look absolutely delicious! We are hosting a holiday cookie recipe contest on our site with lots of great prizes and would love to have you submit one your great recipes! Thank you for posting this to pinterest, which is where I found your recipe. If you don’t mind, I’m going to link up to it in my blog post which is going to be published tomorrow. I have a list of things I want to cook/bake in 2013 and biscotti is on it. Your recipe is the easiest one I found online! Thank you for letting me know you enjoyed my Chocolate Chip Cookie Biscotti recipe!